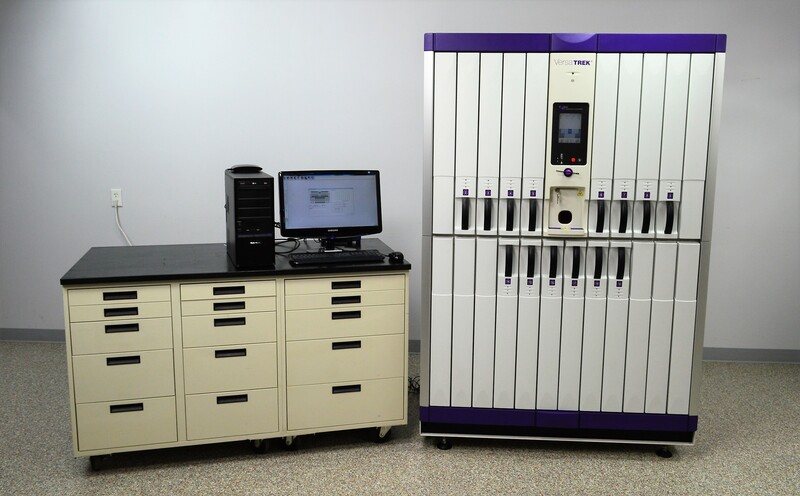 Thermo VersaTREK Automated Microbial Detection In Vitro Diagnostic 6528 . New Life Scientific, Inc. This instrument is quite young compared to previous Versatrek models that we have encountered, having been originally purchased in September of 2014. This microbial detection system is in excellent cosmetic condition and appears to have been well-maintained. There were scuffs on the paint when this product arrived at the New Life Scientific warehouse, likely incurred from banding, and were professionally retouched. New Life Scientific technicians evaluated and tested the controller interface, individual motor slots, PC workstation, and confirmed that the system is functional. The electrical connections and cable were inspected, and confirmed acceptable for use. The lights, alarms, and fans all function without errors engaging, as necessary during normal operations. The instrument was powered on in April and May 2017 for extended testing in which two motors were replaced and they are ready for application. The Versatrek is aware of all drawers, noting that when the drawer is open the bottle status indicators illuminate. The technician checked several positions on each drawer for stirring and bottle insertion recognition. The built in barcode scanner worked flawlessly and allows the user to input sample data from the touchscreen interface or the PC workstation. This instrument has 14 drawers with 336 bottle slots that can accommodate more drawers to meet your laboratory volume needs. The easy-to-use touchscreen interface includes a stylus, but most sample data can be input in the included Versatrek computer package. Each REDOX 1 aerobic bottle contains a tiny stir bar allowing for continuous mixing of the sample and broth. When an aerobic bottle is placed into the VersaTREK drawer location, a rotating magnet under each bottle captures the stir bar and initiates continuous, uninterrupted mixing throughout the cycle. VorTrexing's unique agitation concept improves oxygenation of the broth for aerobic organisms when compared to simply rocking or shaking. There are Myco and anaerobic bottles that allow a wide range of culture growth and monitoring of blood cultures, sterile body fluids, and mycobacteria.